I like vodka and I like orange juice but vodka and orange juice together is boring. The only reason to drink the two together is to make that gallon sized plastic bottle of rot-gut vodka you bought on sale at the drug store more drinkable. If you left my bar with a screwdriver it meant that I didn’t do my job to talk you into a better tasting drink – or that you needed to calm your morning shakes. Because the Screwdriver is such a boring cocktail I am always looking for ways to improve it and give it a reason for existing. In this case, a little fresh basil is all that is needed to turn something boring into something well worth drinking. Pour all of the ingredients into an ice filled shaker. 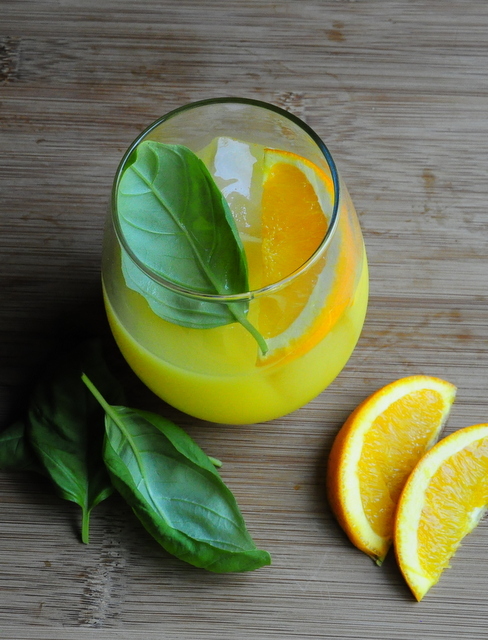 Shake and strain into an ice filled glass and garnish with a slice of orange. Now take a basil leaf and place it into the palm of your hand. Slap the leaf with your other hand to release the aroma and drop it into the glass.